NASASpace shuttle Atlantis at prelaunch. Many astronauts agree that the few minutes following lift-off are some of the most terrifying moments of space travel. Luckily, former Canadian astronaut Chris Hadfield, who retired last year, is happy to share those thrilling minutes. While on the launchpad, NASA’s space shuttles weighed 4.5 million pounds and towered at a height equivalent to the length of two football fields. Two solid rocket boosters that each burn 1.1 million pounds of fuel in the first 2 minutes. Three main engines on the shuttle itself that ignite exactly 6.6 seconds before liftoff feeding from an external fuel tank that stores liquid hydrogen and oxygen. The three engines burn for about 8.5 minutes after lift off, all the while extracting fuel from the tank at the same rate it would take to empty a family-sized swimming pool in 10 seconds. The three engines burn 1.6 million pounds of fuel propellant total during that 8.5 minutes. 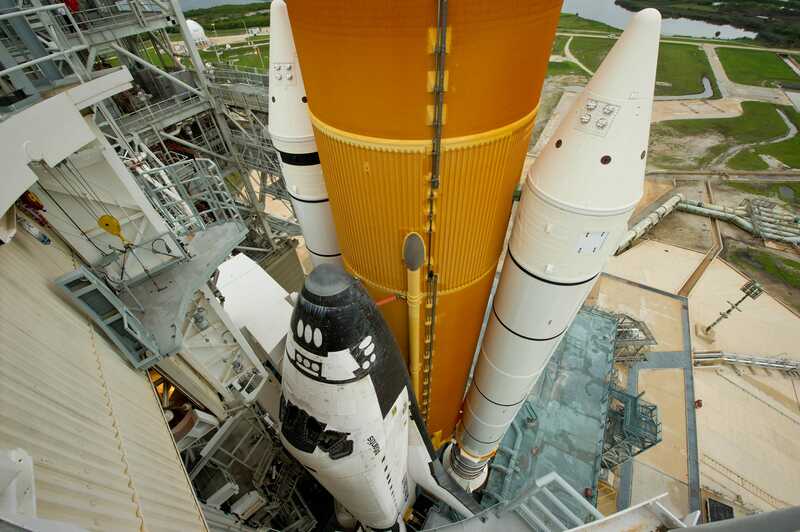 So, between the rocket boosters and the main engines, it takes 2.7 million pounds of fuel to get to space. In the 8.5 minutes it takes the shuttle to reach space, it accelerates from zero to 17,500 miles per hour — 23 times faster than the speed of sound. Hadfield‘s first-hand account of what that actually feels like will get your heart racing. “Six seconds before launch of the shuttle the engines start to light and when the engines light it bends the whole thing, so you can actually feel the whole vehicle sway away from you as the engines light,” explains Hadfield, in this incredible video below. atticus vadera/YouTubeA NASA space shuttle launch. atticus vadera/YouTubeA bumpy shuttle ride. atticus vadera/YouTubeA NASA space shuttle rising higher. atticus vadera/YouTubeRocket boosters explode off of the shuttle. While the NASA Space Shuttle Program was retired in 2011 (we now rely on Russia to shuttle NASA astronauts), there’s still hope for our space ambitions. By 2017, NASA astronauts will hopefully have the chance to launch on American soil with space taxis built by the two corporations: SpaceX and Boeing. Funding for these two programs was just announced in October.